What tools and supplies do you prefer when you are painting? 1.) Ergonomic Roller Handle and Paint Brushes – You might be tempted to buy one of those economy packs of painting supplies or just grab the cheapest options available. But when it comes to paint brushes and rollers, that would be a big mistake! You’re going to be holding onto these items for the duration of your project, why not make sure they are comfortable and fit well in your hands? Trust me on this one, there is nothing worse than only being half done with a project when your hand starts cramping up! 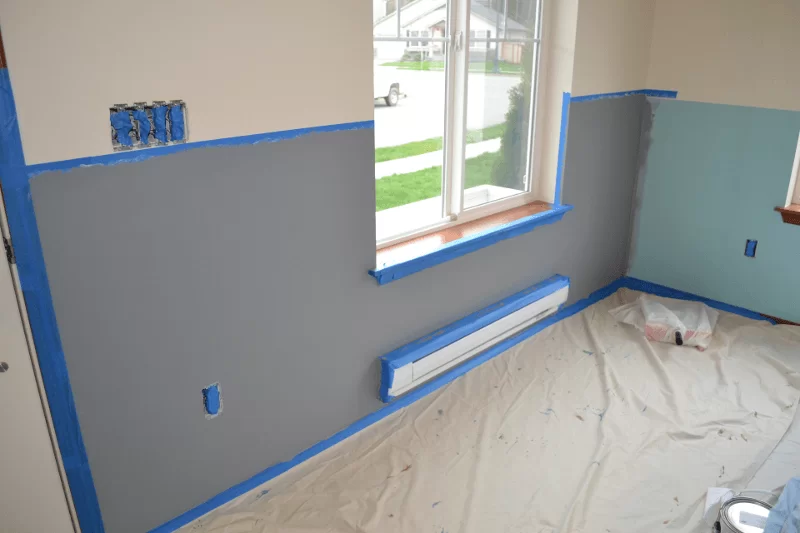 It isn’t pleasant and spending just a couple more dollars on an ergonomic roller handle or paint brush could make a big difference in your ability to finish the painting project. 2.) Quality Angled Paint Brushes – A quality angled paint brush will make your life a whole lot easier when it comes to cutting in (edging). It’s easier to control where the paint goes and the angled edge makes working in a corner or along trim easier, as well. What I mean by quality paint brush is one that isn’t going to shed on you. The cheaper poor quality paint brushes can start shedding as you’re painting. So you’ll have to start picking the bristles off your wall or they will dry with the paint and become noticeable blemishes. It’s easier just to avoid this whole scenario and purchase good quality brushes from the start. My favorite angled brush is a 1-1/2″ Purdy brand brush. The size is perfect for edging by a baseboard heater or along the ceiling. Purdy paint brushes also last forever if you treat them right. 3.) Correct Size Roller Covers – Using the correct size roller cover is important for two reasons: first you want to make sure the length of your cover is correct for the size roller you have. So if your roller cover is 9 inches, your roller handle should also be 9 inches. Secondly, roller covers come in different nap sizes. Smaller nap sizes are for smooth surfaces (like furniture and table tops) while bigger nap sizes are for rough surfaces (highly textured walls and rough wood surfaces). Most roller covers are labeled clearly with their nap size and what type of surface they are good for. 4.) Plastic Roller Tray – I prefer the plastic roller trays because they’re easier to clean and don’t rust over time. Even with their no-rust advantages, I still try to get as much paint out of the tray as possible, and then I set the roller tray in the garage to dry out. Once it’s dry, I peel the remaining paint off and have a brand new tray. 5.) Handy Paint Cup – This little red cup is one of my favorite painting supplies, and it makes painting so much easier for me! It’s ergonomic to hold and very handy to tote around. As an added bonus, there’s a magnet inside the cup that holds your paint brush up and out of the paint inside. Handy Paint Cups come in a couple of sizes, but the smaller one is just perfect for edging and small projects. 6.) Scotch Blue Delicate Masking Tape with Edge Lock – If you’re needing to tape off an area or make a straight line for your painting project, then Scotch Blue Delicate Masking Tape is the best tape I’ve found by far. Plus, it’s for delicate surfaces so you don’t have to worry about it taking off the existing paint or stain. On minimally textured or smooth walls, you could use this tape and have a perfect line with no bleed through. Surprisingly, even on textured walls, this painters tape does a fair job of preventing any paint from bleeding through. However, if you need perfect lines, consider adding my next item. 7.) Paintable Silicone Caulking – Grab the kind that comes in a squeezable tube, not a caulking gun (this will be easier to control). And make extra sure it is labelled paintable caulk. 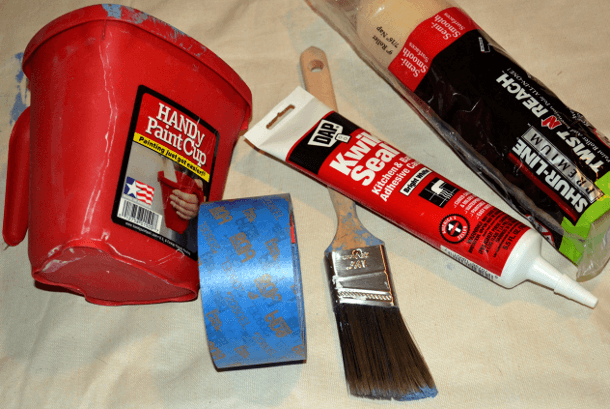 To make perfect tape lines, you’ll squeeze a bead onto your finger and rub it over the edge of the paint to make sure the tape edge is sealed. Then once the caulking is dry you just paint right over it. Using the caulking is especially important for textured walls because it will ensure that the tape sticks to the wall evenly. Thus leaving you with a smooth and straight line free of blemishes. 8.) Self Leveling Laser level – A self leveling laser level is a good all around tool to have when you’re making over a room. Especially if you need to end your painting at a straight line. Whether you’re making an architectural statement or painting a pattern of lines, a laser level with help save you time. Set your level to your desired spot and use a straight edge and a pencil to draw your line. 9.) Double Layer Drop Cloth – A double layer drop cloth will offer more protection from spills. The top layer will absorb the spilled or splattered paint while the bottom later will keep the spill from soaking into what’s underneath. I prefer the drop cloths that have a canvas texture on the top and are coated with vinyl or rubber on the bottom. Knowing that no matter how much paint I spill or splatter it won’t soak through, gives me peace of mind. 10.) Rubber Mallet and Paint Can Opener – Unless you are using Dutch Boy paint (Dutch Boy Paints comes in an easy to open and pour container) odds are you’ll need a paint can opener and a rubber mallet to seal the can back up. While you could accomplish the tasks of opening and closing paint cans with other items from your tool box, it’s easier and generally more pleasant to use a paint can opener and a rubber mallet. Especially, considering they don’t risk damaging the lid. 11.) Painters Rags – I always keep a heap of painters rags near me, as well as a few in my pockets while I’m painting. That way they are close by to help clean up a spill or get paint off of trim quickly. Also paint rags work much better than paper towels, because they can absorb more paint and don’t fall apart. 12.) Water – I keep two containers of water handy when I’m painting. One in an open container so that I can just dip a painters rag in it in case of an accident – like getting too close to trim work or accidentally painting the ceiling. The second is a water bottle I don’t mind getting paint on, so that I can stay hydrated while I work. By keeping the water near by, I eliminate the risk of tracking paint through the rest of the house when I’m thirsty. I’m sure there are a few more items I could add to this list, but these are the ones I find myself using the most. These are also the items that I kick myself for when I don’t have them readily available. I hope these help you out as you plan your next project! Do you have questions about the selecting or the installation of: tile, carpet or wall treatments (window blinds, etc)? Then email me your tale of woe(diva(at)homemakeoverdiva.com) and perhaps I will be able to answer your questions right here at the Home Makeover Diva Blog! How Many Coats Of Red Paint Are Needed?